Ottawa State Lake - all photos by Jim Mason Ottawa State Fishing Lake is located on Sand Creek in the Smoky Hills. Tallgrass prairie and croplands surround the cottonwood and hackberry woodlands that border the lake and the two streams that feed it. Look for white-tailed deer and coyotes year-round. From spring through fall, sliders and painted turtles can be seen basking on snags and rocks. American goldfinches, black-capped chickadees, and northern cardinals are active at the edges of the timber and thickets. 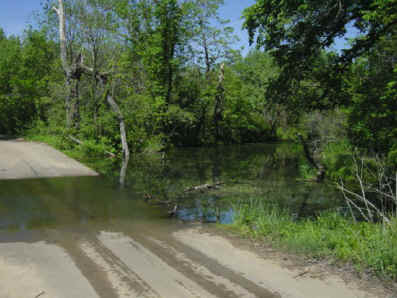 Low-water crossing at the upper end of the lake. Signs of beavers, raccoons, and muskrats are evident along the streams and marshy areas of the lake. Watch for wood ducks, mallards, belted kingfishers, and wading great blue herons and great egrets. The shallow upper reaches of the lake are covered by Fragrant water lily (Nymphaea odorata). The box culverts underneath U.S. 81 highway at the K-93 exit are home to a massive colony of cliff swallows. Swarms of them may be seen nearby during late spring going into summer. Click the icon to find a birding list for Ottawa County. Directions: From Salina, go 16 miles north on U.S. 81 and then 4 miles east on K-93. 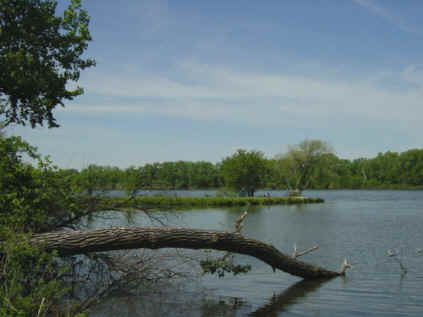 Ownership: The entity responsible for management of Ottawa State Fishing Lake is the Kansas Department of Wildlife, Parks & Tourism. Contact them at (785) 628-8614 if you have specific questions about use or management of this site.